One of Citrix's announcement from last week's Synergy conference was a new end-user product called "Dazzle," which can only be described as "iTunes for your apps." 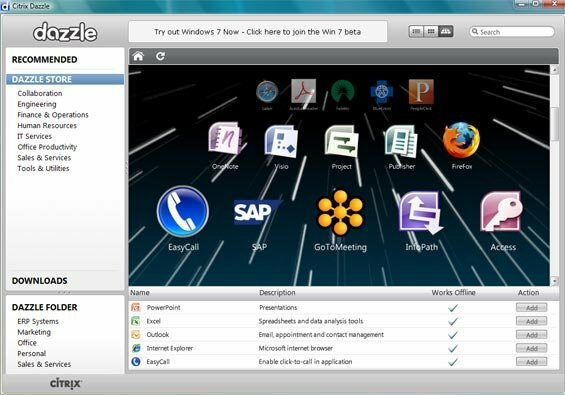 From a technical standpoint, Dazzle is a fancy front-end to an existing Citrix Receiver on a Windows or Mac client. As such, it can connect to multiple back-end XenApp or XenDesktop farms, and it can totally integrate with Citrix Workflow Studio, allowing users to self-provision IT services and new apps in addition to launching existing apps. Now here’s the crazy thing about Dazzle: I really like it! Yes, I understand that it’s nothing more than stupid eye candy, but I like that Citrix is offering this to users. I like that the “Dazzle” logo is a cool Web 2.0-looking thing. And I like that users will understand how to use it. Dazzle should be available for both Windows and Mac by the end of the year. Funny I thought the logo was the worst part of this upgrade/new product. It looks cheesy, and playful and unprofessional. It reminds me of the Windows XP Fisher Price look. What year is it....2001? Beyond Apps hosted on XenApp and Desktops from XenDesktop Dazzle can also allow IT to publish internal Web Apps or Cloud based SaaS Apps fom multiple providers. These apps can run in the local browser if desired by IT. This makes Dazzle the one stop destination for employees that IT contols for all apps ( not just Citrix apps ). Add to that self help support content and online GoToAssist and users should benefit beyond just the cool UI. Well remember that Dazzle is a consumer-ish front end for the Citrix Receiver.. so if you don't like Dazzle, you don't have to use it. You can just use the Receiver. I really like the idea and if they need to steal shamelessly from Apple. Good on them. The easier and more familiar the better. Ever read a user guide for iTunes or the iTunes store?